Have high speed only. Lost low and intermittent speeds. Do you think its the wiper control module or the wiper motor? When I turn the wiper stick to intermittent, I hear a click from the wiper control module if that matters. Turn ignition switch to LOCK position. Disconnect wiper motor harness connector C151. Turn ignition switch to RUN position. Set wiper switch for low speed operation. Measure voltage between terminals No. 6 (Dark Blue/Orange wire) and No. 5 (Yellow/Red wire) at wiper motor harness connector C151. See Fig. 4. If battery voltage does not exist, go to next step. If battery voltage exists, test wiper motor. See WIPER MOTOR under COMPONENT TESTS. If wiper motor is okay, repair wiper linkage as necessary. Turn ignition switch to LOCK position. Disconnect Wiper Control Module (WCM) harness connector C294. Measure resistance between ground and terminal No. 8 (Dark Blue/Orange wire) at WCM harness connector C294. See Fig. 2. If resistance is greater than 10 k/ohms, go to next step. If resistance is 10 k/ohms or less, repair short to ground in Dark Blue/Orange wire between wiper control module and wiper motor. Measure resistance in Dark Blue/Orange wire between terminal No. 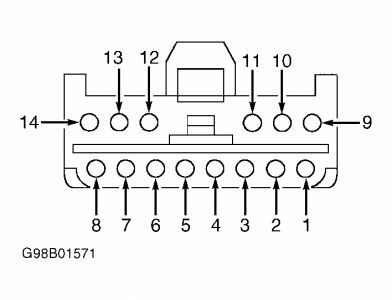 6 at wiper motor harness connector C151 and terminal No. 8 at WCM harness connector C294. If resistance is 5 ohms or less, go to next step. If resistance is greater than 5 ohms, repair open in Dark Blue/Orange wire between wiper control module and wiper motor. Set wiper switch to low speed position. Measure resistance between terminals No. 1 (Orange wire) and No. 7 (Brown/White wire) at WCM harness connector C294. 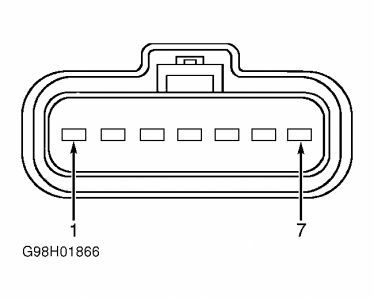 If resistance is 3500-4500 ohms, replace wiper control module. If resistance is not 3500-4500 ohms, replace multifunction switch. Ok when the wipers are turned on delay, when they stop they stop in the up position. If you take the wiper arm off of the motor and turn the rotator around. It stops in the up position. What would cause that problem? The park circuit in the wiper motor is faulty. Replacing the wiper motor should solve your concern. The wiper motor will only work on high and will not send water to clean. Now it will go on and off and will stop in the up position. Now it will not work at all. Have you checked to see if the motor is getting power as well as the washer pump? I did not, but not sure how to check or what pins to check for power water ETC. It looks like the relay fuse by the engine is okay and the fuse in the car looks okay. I assume that if the washer motor is bad the wipers will still work? I did replace the wiper motor and there was small amount of water in the wire clip to the motor I cleaned it put it back and still will not work. The washer motor has seperate wires going to it. Check them for power. One is a ground and the other is power. Sorry, I was out sick, but I did try to test the wiper motor but my tester it too big. I did go and get another wiper motor and switch started with the motor and no luck then with the new motor in I replaced the switch and no luck and then put them back the way it was but now try to find the problem, I hear a click when I put the switch on low or high or push to have water I hear one click per push. I think it is coming from the wiper motor. Have you made sure the motor has a good ground? I assume. I put the reman motor back in the same way I think. How could I check to make sure and would this problem let me still a clicking when I turn on the motor (one click per setting) and with the motor not in right would this stop the water from coming out or could the washer motor be bad too? The washer motor is a seperate item. It is located at the bottom of the washer fluid bottle. Thank you for that but I do know that, what about the wiper motor (clicks when you push the wipers water or on low ECT) and how is the ground put to the motor IE: by the wires only or by the mount for the motor. Will the washer motor still work if the wiper motor is bad or what if the washer motor is bad will the wiper motor not work? All I know is I put a new reman wiper motor in and when I turn on the wiper to high or low I hear one click but the wipers will not work. As far as the wiper motor and washer motor, one will not stop the other. The ground is made through the mount to the body. If you only hear one click and the motor doesn't work, check to make sure there is power to the motor. If there is, try running a ground wire from the motor to the a good ground on the body or directly to the battery. Without performing any diagnostic tests, it is impossible to comment if components needs to be replaced. It could be a wiring or ground circuit connection problem. Are the problem symptoms similar to previous? Were parts replaced new, used or reman? Does the headlights work intermittently? The wiper components were new. The LCM was from a wrecking yard. This time the head lights only failed to turn on once, they have not gone out while driving, but I'm afraid to drive at night because I'm unsure if the lights will go out and strand me. Last time they quit coming on at all. I have a LCM headed my way through the mail. I ordered the LCM before I discovered the wiper issues. Last time the wiper issues started with the washer fluid pump going off by itself, followed by the wiper not parking themselves and only working on high. Would you be able to perform tests on the wiper system with a DVOM if I provide you with the procedures? Wiper is linked to LCM so if you have ordered the LCM, install it and see if the wiper problem is resolvd. 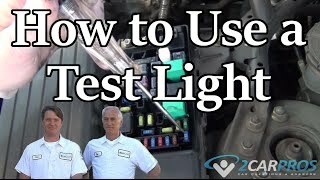 I should be able to use my DVOM to perform tests on the wiper system, especially under the guidance of an expert as yourself. The only obvious obstruction that exists now is can I FIND my DVOM. Are mist and intermittent speeds working correctly? The chart shows the procedures for teating the wiper switch. Go through them and see if you can get anything out of it. Try whistling and see if the DVOM comes wagging its tail to you, lol. Windshield Wipers Fail To Retract/position Themselves In The Down Position When Turned Off. They Stay Positioned Straight Up. What Is Wrong?